ITMO’s Military Department has a long history of providing students with on-campus military instruction, dating all the way back to the 1930’s, when the university was still called Leningrad Institute of Fine Mechanics and Optics. But it was only in 2009 that, after numerous administrative transformations, the Department assumed its contemporary form. offering support and vocational counseling to students interested in working for the military. Today, ITMO University’s Military Department offers an extensive range of professional tracks within the personnel training framework of Russia’s Armed Forces, Ministry of Emergency Situations, national civil defense troops, and military-industrial complex. All full-time ITMO University students who are Russian citizens and qualify as fit for military service are eligible to apply. 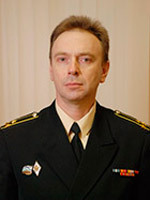 Having completed the military training program, students can go on to serve in the Armed Forces of the Russian Federation and other national defense and law enforcement agencies. ITMO University Military Department’s training infrastructure consists of two modern training buildings, state-of-the-art equipment, and a special training area in ITMO University’s own sports-and-recreation facility in the Yagodnoye village. It is here that students develop their skills of handling basic weapons, steering boats, levering sails and using lightweight diving gear, as well as practice applied military sports. All of Department’s staff are highly-skilled and experienced specialists who have undergone extensive military training and served in the Navy and other military troops.